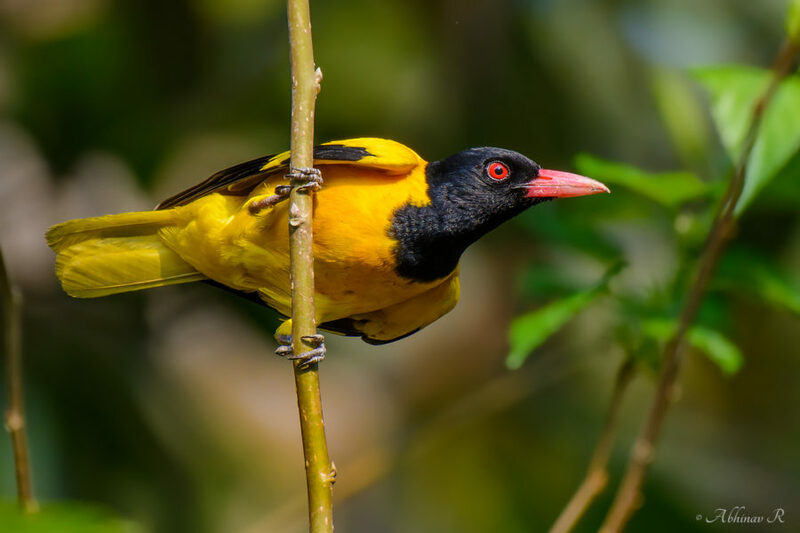 Black-hooded Oriole is a common bird from the Oriolidae family. The bird has a black hood as its common name indicates. Photo 1: Exif- f/5.6, 1/400s, ISO-400, 500mm, Nikon D7100, AF-S 200-500mm f5.6E. Date- Mar 13, 2016. Location- Cheruvally, Kerala. This photo is from my home yard itself. It often visits here to feed on the mulberry trees. It is a resident in this locality. Seen here in single and pairs. Appearance: The primary color is golden yellow. The head, neck, throat and breast region are black. This helps to easily identify this oriole from others. Wings have black and yellow colors. Eyes and beaks are pinkish red. The male and female look alike. Distribution & Habitat: This is a common bird of the Indian subcontinent. The habitat ranges from forests to villages and even urban areas. Often visits gardens with fruit trees. Some calls of this bird are melodious and distinct, which can be heard at a fairly long distance. Black-hooded Oriole is usually very active and arboreal, stays on the upper branches. It sometimes comes down to lower branches (in the range of 5 feet from the ground) to feed on fruits.